Pazham nirachathu is a very tasty and inevitable snack in the Malabar iftar cuisine. 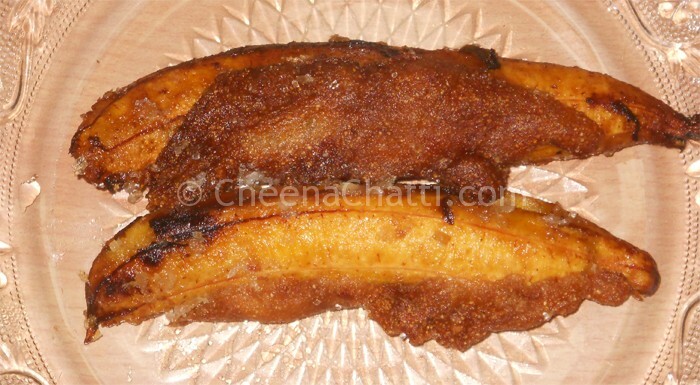 Its prepared by stuffing ripe plantain with coconut – nut mixtures and then dipped in a Maida batter and fried. I can assure you that your family and Kids will love this snack. Warm a non stick pan with the ghee. Heat the grated coconuts in the pan (Keep sauteing). Add the chopped cashew nuts, raisins, cardamom, sugar to the pan and heat it until the nuts are fried (Keep sauteing). Remove from the stove and keep it aside. In a bowl, mix together the Maida / all-purpose flour, sugar and salt. Add water to this little by little and make a thick batter out of it, similar to that for pazham pori / Banana fritters. Peel the banana and make a shallow slit lengthwise. Remove the center portion with the black seeds. Thickly fill the fried coconut-nut stuffing mixture into the slit made in the banana. Heat oil in another pan, and dip the stuffed banana’s in the batter to get it coated evenly. When the oil becomes hot, minimize the flame and carefully dip the batter coated banana’s. Fry them till they become golden brown in color (carefully flipping in between). Drain them into a kitchen tissue and serve it hot with a cup of tea. Some people wont dip the entire banana’s in batter, they will just seal the nick created for filling. This entry was added on August 16th, 2013 by Reeja MytheenKunju in Bakery and tagged with malabar pazham nirachathu, indian pazham nirachathu recipe, ramzan recipes, pazham nirachathu stuffed plantains, prepare pazham nirachathu, nadan snacks, banana, iftaar recipes, nadan palaharam. Last revised on March 29th, 2018.